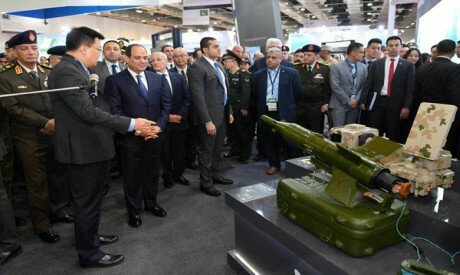 President Abdel-Fattah Al-Sisi, supreme commander of the Armed Forces, inaugurated the first edition of the international Egyptian Defence Exhibition (EDEX 2018) in the company of senior military officials and undertook a tour of the various pavilions. General Mohamed Zaki, minister of defence and military production, explains that EDEX 2018 has four aims. 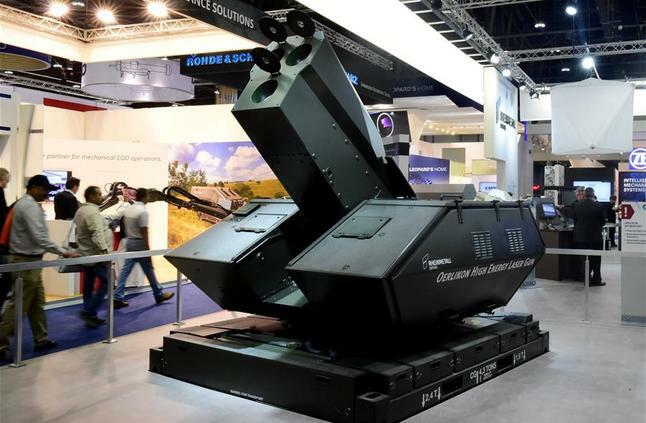 First, the international event “offers countries and companies that produce weapons and defence systems the opportunity to display the latest advances in military technology”. Second, it provides “a sophisticated military gathering at which expertise can be exchanged and relations between states strengthened militarily and in the fields of military production”. 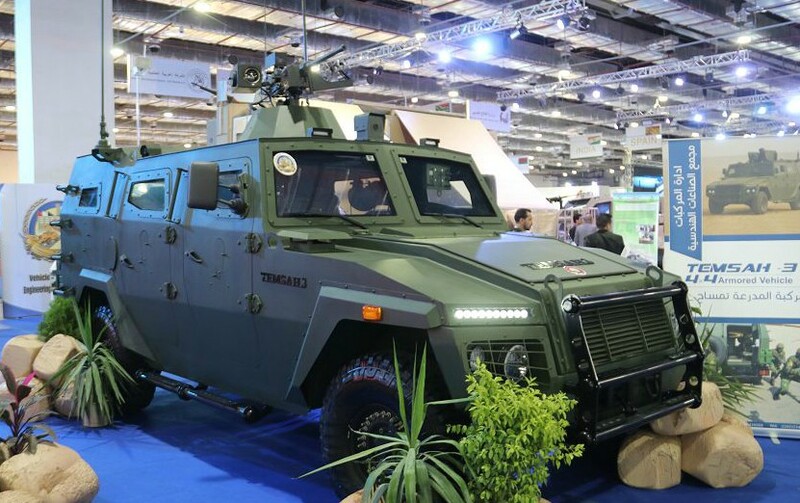 After a brief summary of the Egyptian military’s plans for modernisation and development, Major General Tarek Saad Zaghloul, chief of the Armed Forces Armament Authority, offered facts about the exhibition. 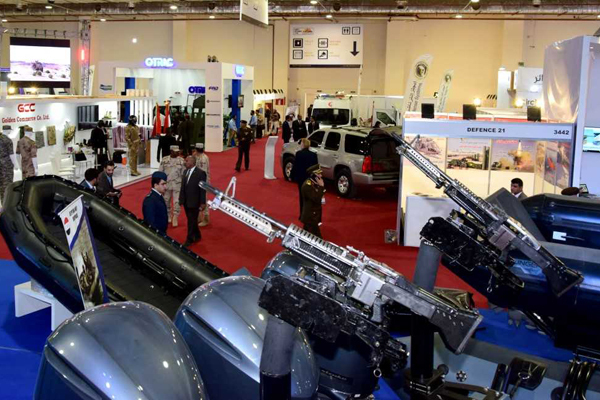 More than 376 military firms and institutions from 41 countries were participating in the first edition of EDEX and 10,000 visitors from the international military and arms manufacturing community are expected to attend. The event, sponsored by 15 international and local firms, took place on exhibition grounds measuring 19,200 m2, of which 17,000 m2 were allocated to internal exhibition spaces and 2,200 m2 to external exhibition spaces. 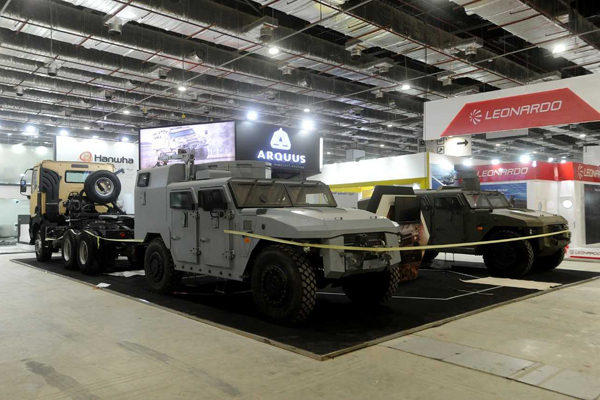 One of the spaces of the expo has been dedicated to a “Security and Counter-Terrorism Zone” where manufacturers can showcase the weapons and equipment they produce for the fight against international terrorism. Bilateral meetings between military officials were held on the sidelines of EDEX 2018. Defence Minister Mohamed Zaki met with his French counterpart Florence Parly, his Greek counterpart Panos Kammenos and his Cypriot counterpart Savvas Angelides. The ministers discussed the latest regional and international developments and ways to strengthen military cooperation. Lieutenant General Mohamed Farid, chief of staff of the Armed Forces, met with Yong Hong, head of South Korea’s Defence Needs Management Program; Lieutenant General Mohamed Freihat, Chairman of the Jordanian Joint Chiefs of Staff; Evangelos Apostolaks, Chief of the General Staff of the Greek Ministry of Defence and General Fayad bin Hamed Al-Rawaili, chief of the general staff of the Saudi armed forces. 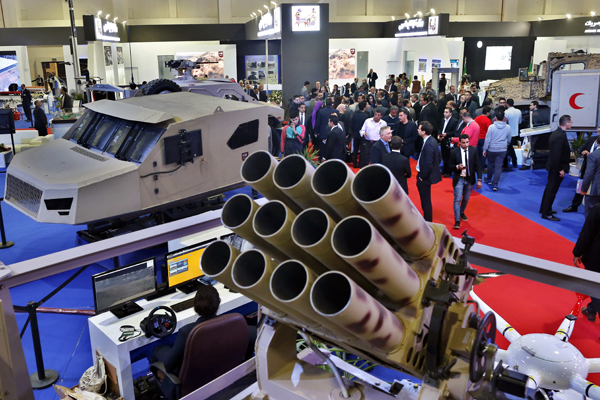 US arms manufacturers took prominent stands in the exhibition. Diane James, who represents Military Truck Parts Inc, said this was her first visit to Egypt even though her company has had an office in Cairo for 20 years. She is very impressed by the exhibition and by the welcome she received. She believes that the fact that the US had the highest level of representation in the event is a reflection of the closeness of military relations between her country and Egypt. The UAE also had a high profile. In the Emirati wing Al-Ahram Weekly spoke with Abdel-Rehim Al-Husseini, director of Advance PyroTechnics, a company registered with NATO which produces non-lethal firearms. Its products are used by armies and police forces to fight terrorism, quell riots and break up demonstrations. Cairo offered excellent “door-to-door” facilities to the UAE participants, Al-Husseini said. Al-Husseini felt that the Emirates was able to compete in terms of price, quality and technology with international competitors. The exhibition, he said, offered a “strategic platform” and an opportunity for “strategic participation” with Egypt. Dimitry Litovkin, representing the Russian firm Uralvaganzavod, said he had good impressions of his first opportunity to take part in an exhibition in Cairo. He hoped that the quality of the exhibition would be reflected in the level of cooperation between his firm and Egypt. On his expectations from the Middle East market Litovkin said his firm is less concerned with the current volume of trade than with the technologies it can add to the market. 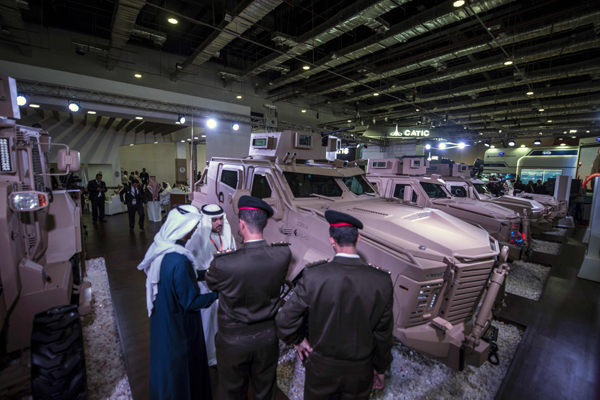 General Mohamed Qashqoush, of the Higher Nasser Military Academy, believes that the military hardware and technologies on display serve as indicators not just of progress in military and defence technologies but of current market orientations. They reflect growing interest in, and the need for, specialised weapons to fight terrorism. “We can also measure competitiveness within the international armaments market and the ability of countries in the region with growing national military manufacturing sectors to compete,” he said. The US, with 42 firms displaying their wares, was the largest participant. France, with 32 firms, was the largest European exhibitor, and also one of the most diverse. Its displays ranged from Rafale fighter jets to maritime hardware produced by Naval Group which is cooperating closely with Egypt through the technology transfer that has made it possible to construct the Gowind class corvette in the Alexandria Shipyard using Egyptian manpower. The French presence at EDEX 2018 reflects the aspirations of French military and defence companies to increase business in the Middle East after successful deals with Arab countries for its Rafales, and Egypt’s purchase of two Mistral class helicopter carriers. Germany, with 19 firms, was the second largest European participant. This reflects Germany’s competitive edge in some areas as well as its eagerness to up its profile in the Arab/Middle Eastern market, especially when it comes to the various models of Germany’s 902-Class submarines. China, the UK and Russia were represented by 16 companies each. China stood out for the diversity of its wares on display, not least missiles of various types and ranges. India and Spain were represented by 13 firms. With over 300 pieces of military hardware and equipment on show the Russian wing drew particular attention. A special attraction was the Ka-52 Alligator scout/attack helicopter which was designed for the Mistral. Other aircraft on display include the Su-35 multipurpose super-manoeuvrable fighter, the MiG-29M/M2 multirole front-line fighter and Ansat helicopters. Russia’s large military, scientific and industrial complex Uralvaganzavod showed its T-90MC, T-90C, T-72 and T-55 tanks, as well as the BMPT Terminator tank support combat vehicle, the IMR-3M Combat Engineer Vehicle, BREM-1M Armoured Recovery, the PTS-4 amphibious transport vehicle, and the TOC-1A heavy flamethrower system. A model B92C2 diesel engine is also on display while the Institute for Scientific Research and Applied Chemistry exhibited maquettes of its smoke bombs. In addition to Uralvaganzavod, major participants from Russia include Aviahelp Group, International Military Technical Forum, MIG, Russian Aviation, Russian Helicopter and Sukhoi. The UAE had the highest representation from the Arab world, with 23 companies, followed by Saudi Arabia and Lebanon, with eight and four companies respectively. he most significant item to be shown was the SG-03 Air Guard radar, a drone with a range of 200km equipped to perform surveillance, reconnaissance and precise targeting tasks. In addition, Saudi-based robotics firms are displaying advanced technologies for handling as land mines and IEDs.